Whitehall-Joan Doty age 81 passed away peacefully March 12, 2019. She was born January 28, 1938 in Whitehall, NY to David and Jean Doty. Joan is survived by two children Pam Hart (Don) and Carl Young (Carol), 3 Grandchildren, Jamie Gordon (Brad), Brian Hart (Alexis), Rachel Young, 5 Great Grandchildren, Dawson Procella, Alexis Procella, Brayden Hart, Beckett Hart, Austin Wilson. 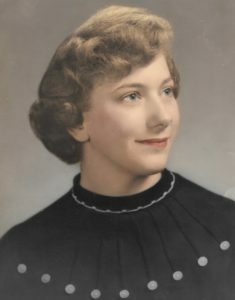 Joan is predeceased by her Sister Monica Freeman, and Brothers Donald Doty and David Doty. Joan worked at Harlem Valley Psychiatric Center 1961-1965, EB Metal from 19—to closing. Joan loved cooking, sewing and especially enjoyed spending time with her grandchildren and great grandchildren. A memorial will be held later this spring.